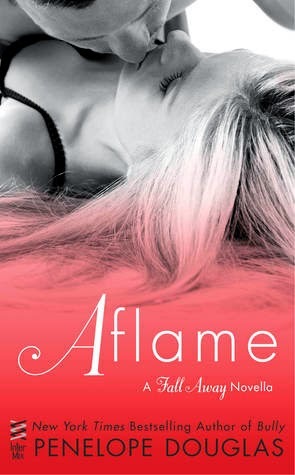 Aflame is the last book in the Fall Away series. I AM NOT READY FOR THIS ! Fall Away has been one of my favourite new adult series ever. Having to let go of this series got my heart breaking. I didn’t know this was the last book until I reach the Epilogue and everything just clicked. That’s when the feels hit me right in the core. But on the bright side, Penelope wrote the most perfect ending for this series. Everything is so perfect it got me grinning so wide. I couldn’t ask for more. I’m happy with how it ends. I’m happy for Jared and the gang because they deserve that. They deserve all the happiness in the world. This is embarrassing to admit but I love angst. Angsty stories will always have a place in my heart. I love to feel the pain, the heartbreak, and all the feels the characters are going through. I want it to hurt. I don’t know why but it feels good. It feels like I am breaking it too. And Aflame has the perfect amount of angst. There are a few scenes in this book that scream angst and they got me clutching my heart because they are all brilliantly written. Kudos to you, Mrs Douglas. I went all AWWWWWWW when Jared, Madox and Jax surround their younger little sister Quinn. I want to see it in my own eyes so bad. Why do they have to be fictional /sigh.